January came in hot and hit us hard in more ways than one. Between two busy office schedules, odd Michigan weather patterns, our social calendar and doing our best to avoid the flu bug (and failing) we're relying hard on caffeine and community. Sickness finally hit Rosewood last week when Natalie epically ended a party at our place by barfing (I kid you not) in the middle the living room where everyone was hanging out. She acted fine the rest of the night and the next day but we skipped church in the morning all the same. Jeff came down with it a few days later and I actually bought our daycare lady flowers this week to thank her for the extra care she gave both kids this week. We're back on the right side of health and soaking up all the Vitamin D we can muster - hello sunshine! This weekend Jeff is out of town with friends from college for their annual Guys Ski Weekend up north. The kids and I are laying low here at home enjoying all-day-PJs, cartoons and baking Valentines Day treats. It's a welcomed relaxing weekend before heading out of town again for work on Monday. Lets rewind a bit, earlier this month we finished out the Christmas parties (finally!) with a celebration for my Mom's side of the family. 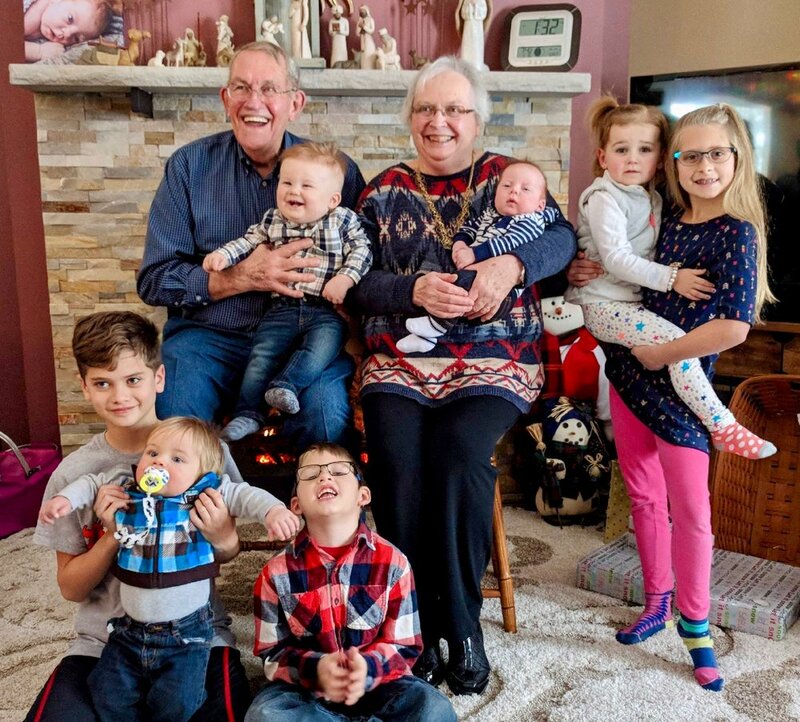 My Grandma and Grandpa DeKoekkoek absolutely love being surrounded by their family and the grins on their faces when they posed for a photo with all of their great grandkids was too much for one heart to handle. They are the sweetest couple and deserve all the happy feels. Later that week I met up with the gals from Watermark for dinner and drinks. This month (there's still time!) Cork Wine & Grille are running a steak dinner special which includes an American Waygu Sirloin, Mashed Potatoes and Chefs Veggies all for $12. THEN... you can add a bottle of wine for an additional $14. Needless to say, that's what I ordered and I was not disappointed. It was a fun night out with the ladies. I can't wait to hit the course with these gals as soon as the weather warms up. Speaking of golf, we celebrated fellow Womens Leaguer and friend Lindsey for her birthday at X-Golf Grand Rapids this month and had an absolute blast! Golf was preceded by Bloody Marys next-door at Sundance - very convenient. X-Golf is a golf simulator where you can golf pretty much any major course in the world. They've got a full bar (bonus), very basic snacks (we're talking poppers and chicken tenders) and many screens for watching all the sports while you golf. I'd put it in the same category as bowling and recommend it for date night or a small group gathering. So fun. 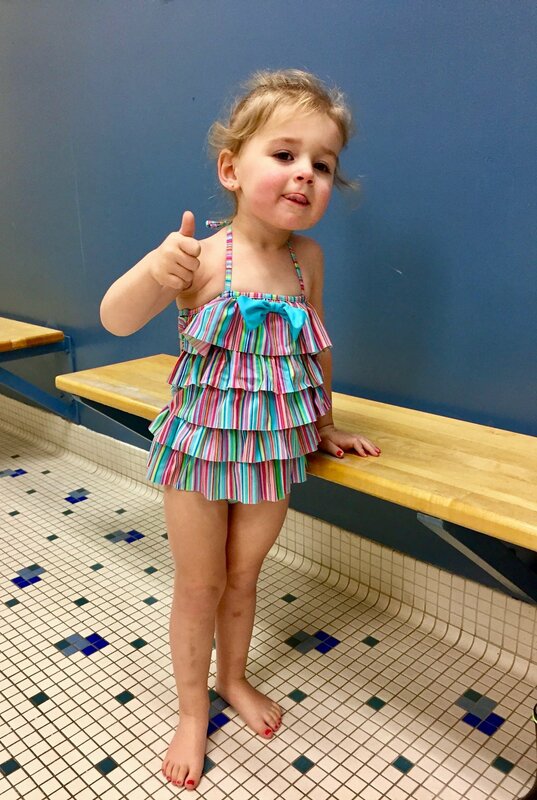 Natalie started swim class this month and loves it. 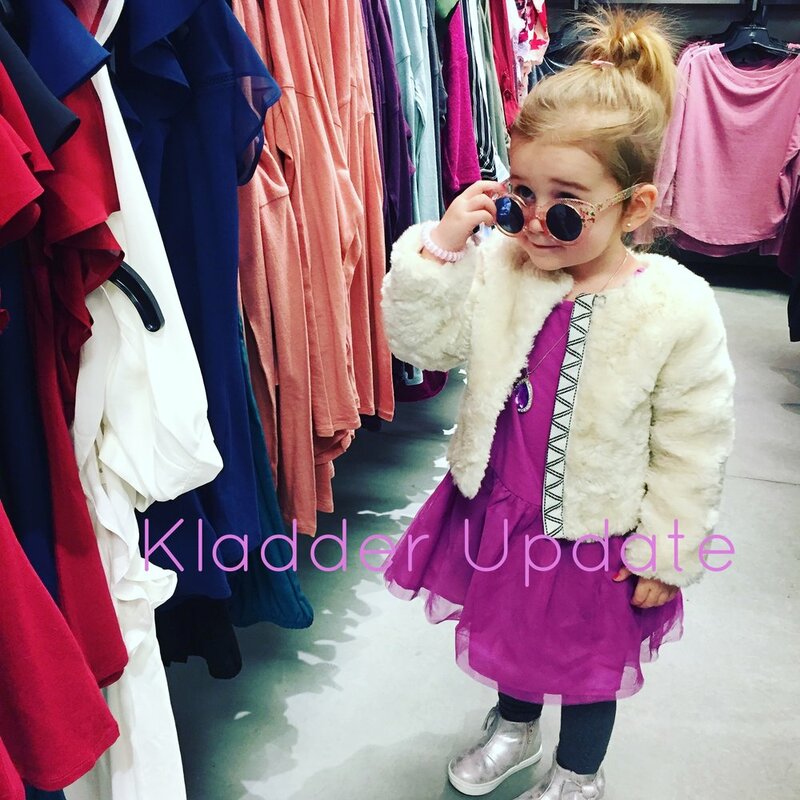 I was out of town for work on her first day so Grandma Kladder (who's quite the fish herself) graciously filled in for me. The class is at Wealthy Pool which is a warm water pool, so nice, and meets once a week for 6 weeks. 30 minutes flies by when you're having fun. I expect Nat will be up a level with swimming come summer time which will make weekends at the lake a whole new ballgame. We also signed Natalie up for preschool set to begin this Fall. Think that's early? Me too. It felt a lot like looking for daycare before your baby's born. It was weird. Vetting and deciding on a preschool was quite the process: we had a list of 6 and narrowed our choice down based off curriculum, teacher vibes, proximity and schedule. Nat will attend Grace Church Preschool later this year. Thomas started crawling a week ago so the baby gates are back! Last Sunday he woke up from his nap, I set him down and off he went. And in case you're curious about his size, last we checked, he weighed in at 27+ lbs. landing him in 18-month clothing. That's 27 pounds of hunky, happy love. 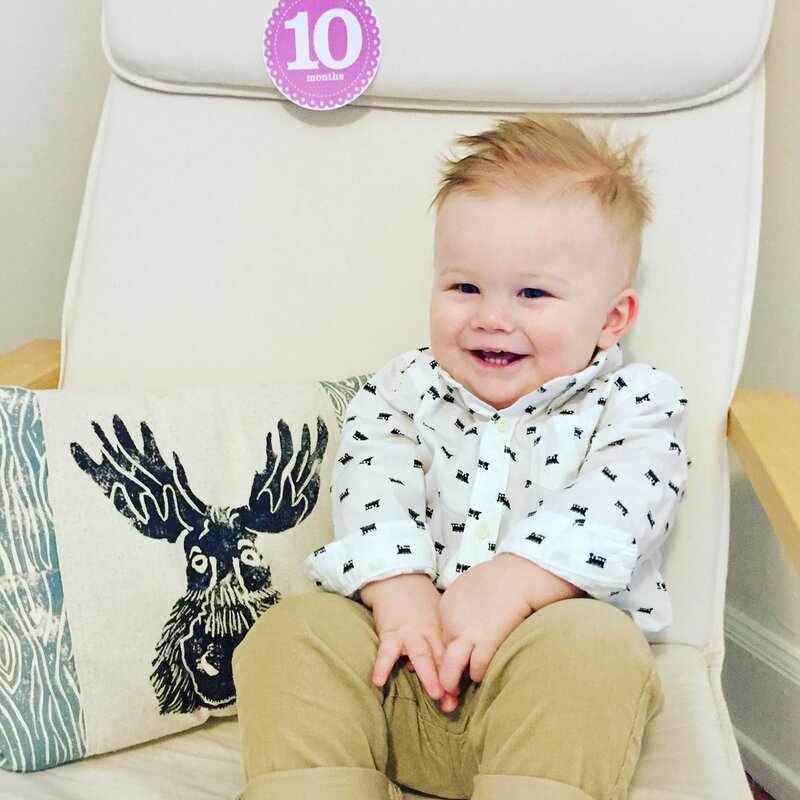 He's 10-months-old today, has 8 teeth and his hair still has a serious hue of red in it. Jeff started winter bowling league two weeks ago at Fairlanes in Grandville with the guys. Jeff might love bowling more than any person I know which is odd because I hate bowling more than any person I know. I'm happy he's able to get his fix each Thursday night without me. Earlier this month we joined our friends Kevin and Ashley for Friday night $2 Beers & Hotdogs at the Griffins Hockey Game. Little known fact about me: I frigg'n love hotdogs. The game was a blast! We hadn't been in years and I had forgotten how energizing the atmosphere was. I probably watched a total of maybe 5 minutes of actual hockey - I was so incredibly distracted with people watching. We started the night at Luna with a margarita (they have a fantastic happy hour) and chips and guac - very good - and ended our night at the ever dependable Bobs Sports Bar on Michigan Ave. Stiff drinks, cheap tabs and Keno for days. Last, I want to mention The Bible Project, something we were introduced to through our church, Mars Hill. In short, TBP is a non-profit that creates short animations (cartoon videos) the help explain the Bible - how to read it, how to interpret it, backstory behind it, etc. I'm bringing it up because the founders spoke at church a few Sundays ago and later that same night we were compelled to return and hear more. Their videos are easy to follow and very helpful. We even used their material as our starting point for house church conversation last weekend. All this to say, if you're looking for a resource, TBP is a good one. Check them out. 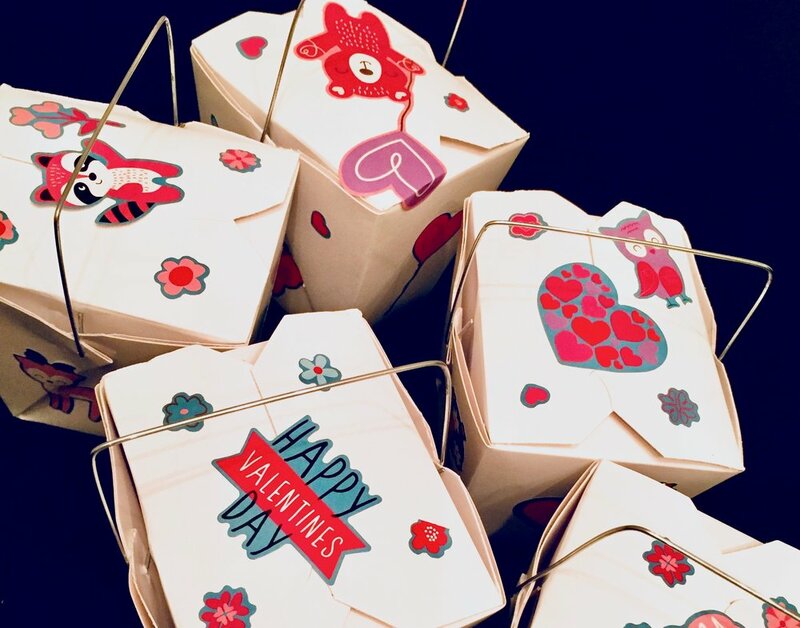 With February just around the corner and the weekend to myself at home with the kids, we are fully prepared for Valentines Day. I played all sorts of homemaker today baking cookies and addressing Valentines. It was a welcomed binge of home life. We're looking forward to another busy and exciting work week starting Monday and we hope you enjoy the rest of your weekend. Cheers! Annie's Organic Pancake & Waffle Mix - It made me wish we had a waffle maker! Manhunt, Unabomber on Netflix - A Netflix original and it's super fantastic. It got a 92 on Rotten Tomatoes if you don't believe me. David Letterman's My Next Guest - Another Netflix original (Netflix is probably going to take over the world) and his first episode features Barack Obama. Bare Apple Chips - They're back in stock at Costco and back in our cupboard!